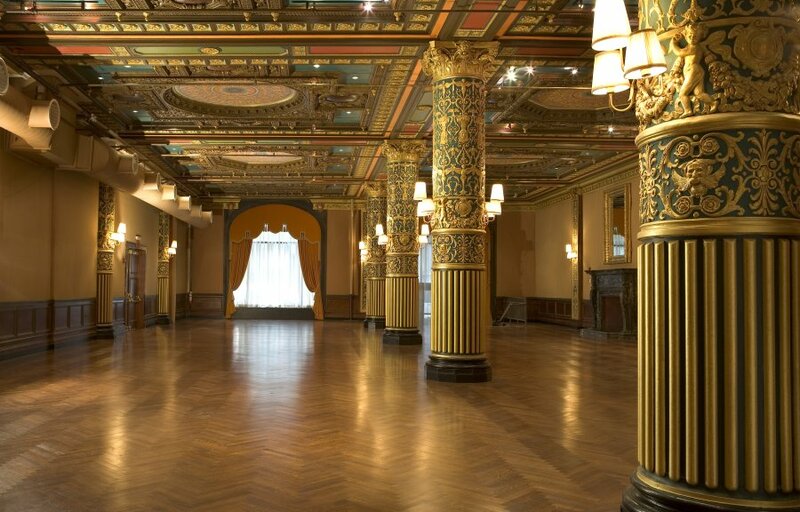 In 2005 the artisans of The Alpha Workshops were hired to work on the restoration of the Prince George Hotel Ballroom. 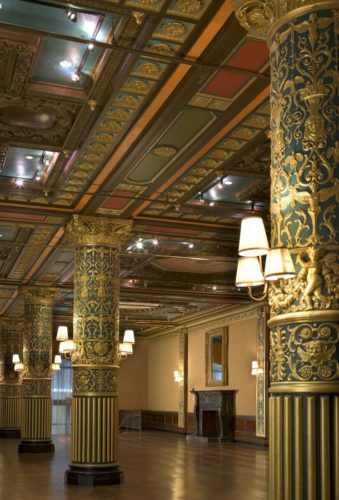 Originally built in 1912, the room was the grand lounge of the exclusive hotel, located around the corner from the famous Madison Square Garden and in close proximity to The Ladies Mile, New York’s fashionable shopping district. We’re revisiting the project- an Alpha favorite – in honor of some big news this week: an important air rights deal that will allow the building to remain affordable to tenants. You can read more about the deal here. Just prior to Alpha being engaged to do the decorative restoration work, the room had been used as a basketball court for the residents of the building, an SRO (Single Room Occupancy) hotel operated by the NYC’s Human Resources Administration during the city’s financial collapse in the 70’s. Much of the relief work on the room’s columns had been destroyed, and the beaux arts figural paintings in the ceiling stolen. The fretwork of decorative plaster moulding – the main feature of the 4000 square foot room – was crumbling and shedding itself onto the floor. By 1989, the families living there were moved out by court order and the hotel was closed, and remained closed for nine years. Then Breaking Ground, a not-for-profit housing development organization, purchased the building to turn into low income housing. The ballroom was destined to become a revenue generating event space. Beyer Blinder Belle was engaged as the architects of the renovation. Enter The Alpha Workshops – and friends. Alpha’s artisans, while mentoring students from the NYC high school of restoration arts, and young people from YouthBuild, led the way in the restoration of the room’s decoration. Molds were made of the columns’ relief work and many hundreds of copies made from the molds, each to be cut and patched in wherever a piece was missing. 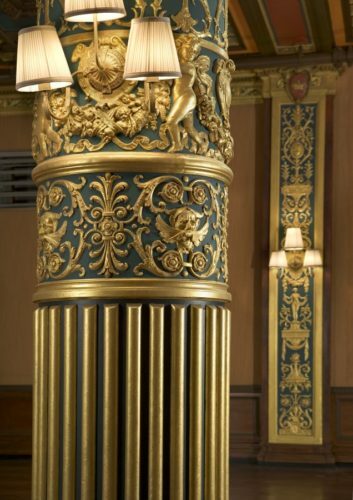 The plaster work was restored and Alpha’s artisans completed the polychrome painting and faux finishing necessary to bring it back to its former glory. Six 8-foot diameter Neo-Renaissance architectural paintings were completed and installed on the ceiling. An enormous 19th century mirror frame was repaired and re-gilded. All was done under the artistic guidance of Jamie Drake, who engaged Alpha for the project, as well as the watchful eye of the Landmarks Commission. The result is a stunning and grand room, a jewel box of gilt and subtle color, ornate plasterwork and sumptuous draperies, all restored to its former glory. The project also garnered a Lucy Moses preservation award, and the restored ballroom is now used as an event space by Breaking Ground, which operates the remainder of the former hotel as low and middle-income housing.